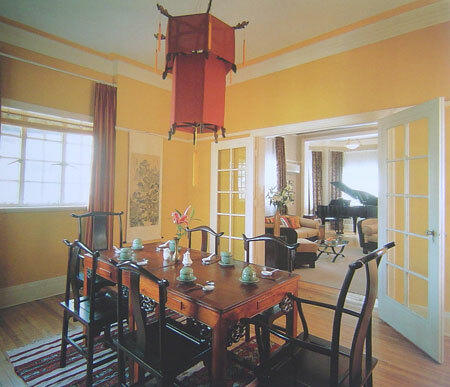 The walls of the dining room are painted a warm mustard colour to offset the burgundy drapes and a restored wooden Qing dynasty lampshade is covered with Xian silk. Six yokeback armchairs - all balanced forms and artistic lines-are placed around the dining table set with traditional Korean celadon ware. Chinese calligraphy, carved woods, latticework, lacquer and open fireplaces define the series of intimate lounges and dining room which make up BAM-BOU restaurant in London's Fitzrovia. Vietnam and China have interwoven histories and today the ethnic-Chinese (Hoa) constitute the largest single minority group in Vietnam. It is common to fine Chinese temples and homes that once belonged to rich mandarins still intact across the country today. The impressive dining room table was one of the first types of mechanical furniture ever built and features a 0.25-m (10-in) flap all around. This can be folded down so the table becomes nearly half a metre (1.5ft ) smaller. In the middle is a 'Lazy Susan' on which stands a Worcester china pot, part of a collection. The pair of 17 th -century Chinese cabinets is made of Huanghuali and Camphor woods. 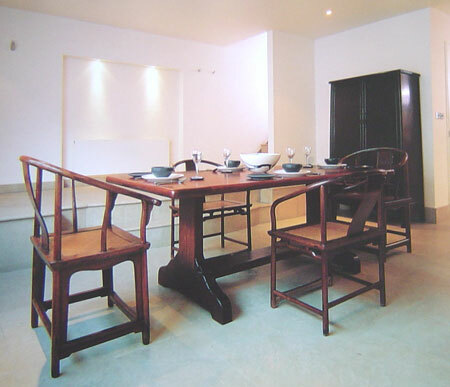 The minimal dining room showcases four Huanghuali horse-shoe armchairs. Against the rear wall stands a sloping stile wood-hinged cabinet. The travertine marble floor heightens the industrial feel of the space. A custom-made dining table and chairs add a contemporary touch to the dining room. An ugly bank of windows has been covered with Japanese style sliding screens, which let the light through. 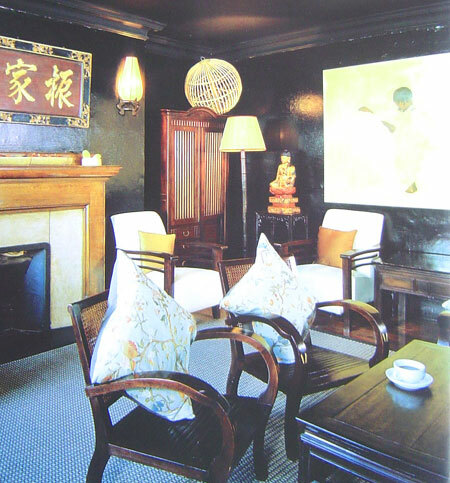 Beneath the windows is a bamboo cabinet and on top an original art deco gramohone from Shanghai. 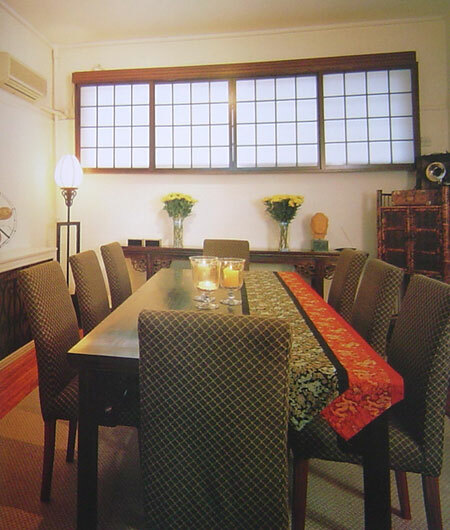 Two Beijing silk table runners add a decorative touch to the dark wood dining table. 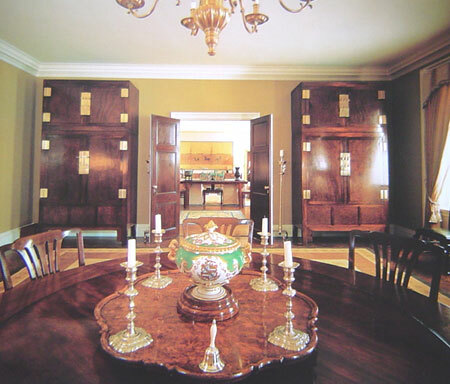 In the foreground is a latticework cabinet used for storing tableware. Chang keeps things simple when entertaining. 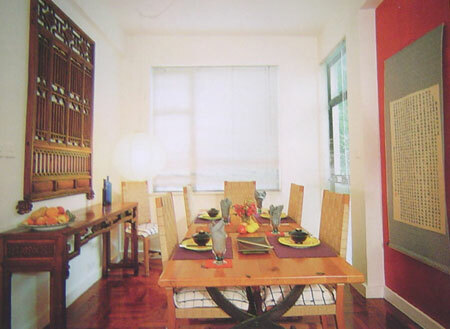 He dresses the table with bamboo place mats, white ceramic fan-shaped underplates and classic blue and white chopsticks. Jasmine tea is served from white china cups. The dining room table has been double lacquered and scraped to look like a painted surface. The pale green upholstered chairs are by Gio Ponto; the tableware is Fort Street Studio's own design. 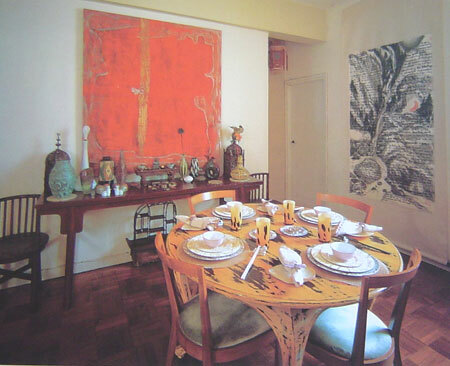 On the altar table is a collection of colored glassware from Germany alongside Westernstyle Chinese ceramics. "We try to find things that are eccentric and European-based; things that are Chinese but don't necessarily look Chinese." Above the altar table is 'Daddy's Girl', a painting by Janis Provisor. In the dining room, a wall has been painted red to provide a striking backdrop for a pair of silk calligraphy scrolls found along the Yang Tze Kiang River. One scroll bears the pre-battle thoughts of Chu Ker Liang, a famous advisor to army generals at the time of the Three Kingdoms. The other scroll reveals his thoughts post-battle. A carved door panel and altar table are against the opposite wall.